Heading Natural products that make a difference. Directions Slowly dissolve one zinc lozenge in your mouth every two wakeful hours. Do not chew. Adults: should not exceed 9 lozenges a day. Youths: should not exceed 7 lozenges a day. 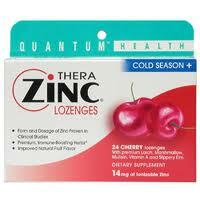 Children under 60 pounds should take 1/2 lozenge every two hours, not to exceed 4 lozenges a day. 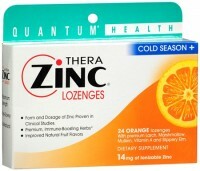 IMPORTANT: Always allow the lozenges to completely dissolve in the mouth. The above dosages should not be taken for more than 7 consecutive days. One lozenge per day may be taken as a preventive. Uses Quantum's dual-action Thera-Zinc Cold Season Plus lozenges contain the form and dosage of zinc proven in clinical studies. 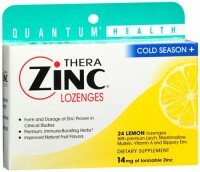 Thera-Zinc boosts the immune system and helps beat the Cold Season. 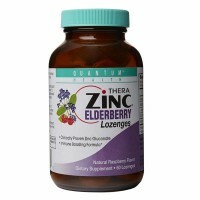 * These lozenges are packed with the highest quality nutrients: immune-boosting zinc, vitamin A, and larch; and soothing mullein, marshmallow, and slippery elm. Contains 24 lozenges. Warnings Keep out of reach of children. Pregnant or nursing women should consult a health professional before using.